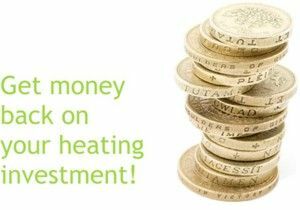 What are the benefits of a Samsung Air Source Heat Pump? 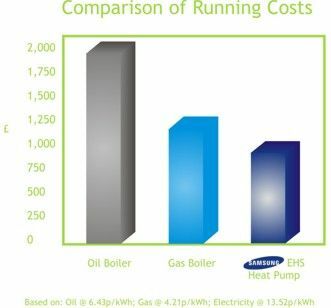 Samsung's EHS can reduce your running costs by up to 30% compared to a standard gas boiler system due to its exceptional efficiency. It is 350% efficient ie you put 1kW of electricity in, you could receive 3.5kW of energy out!. 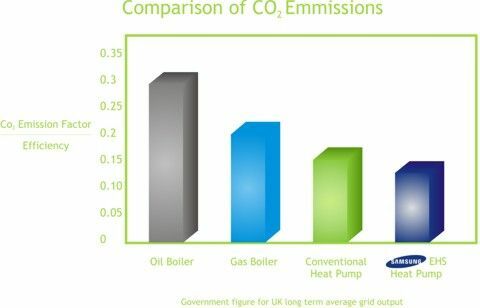 Gas, the highest performing fossil fuel, compares poorly at only 93% efficiency - ie you put 1kW of energy in and you'll only get 0.9kW of energy out! 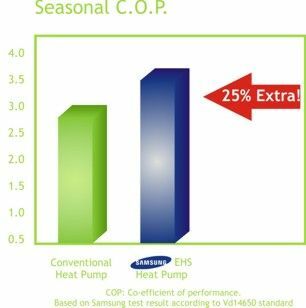 Samsung EHS has proven it optimises heating performances at the temperature of -2 degrees C to 2 degrees C, providing an outstanding SCOP in compliance with eco-design directives. Samsung EHS Mono has substantially reduced CO₂ emissions compared to conventional boiler systems due to high efficiency heat pump technology. The Samsung air source heat pump is eligible for the 7.51p/kWh produced for seven years, under the Renewable Heat Incentive (RHI). This is a government financial incentive to promote the use of renewable heat. Click Here for more information! 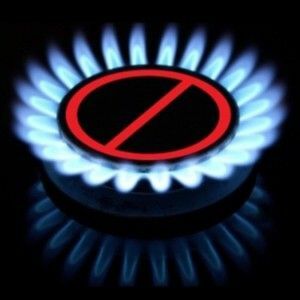 NO GAS in the village? No problem! An air-source heat pump just needs air and electricity to provide all your heating needs!